When discussing the history of Australian Rules football in Australia, the nexus of the game has always been centred on the southern states of Victoria, South Australia, Western Australia and Tasmania. The development of the game in Queensland has often been linked to the arrival on the national stage of the Brisbane Bears, then Lions and the Gold Coast Suns. Yet authors Murray Bird and Greg Parker have spent a decade researching the true origins and development of the game in Queensland, tracing the period of 150 years from 1866 to 2016. 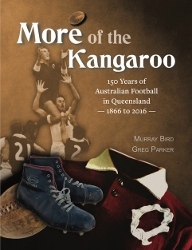 The book “More Of The Kangaroo – 150 Years Of Australian Fotball In Queensland – 1866 to 2016” is comprehensive. From the south-eastern population centres in Brisbane, the Gold Coast, Sunshine Coast and Toowoomba/Darling Downs to the regional cities to the north and even west (Wide Bay, Rockhampton, Mackay, Townsville, Cairns, Mt Isa), Bird and Parker have extensively researched the growth of Australian Rules football across Queensland. Supported by more than 500 photos and more than 1100 pages, this book boasts a level of detail about Queensland footy not seen before. Not only does the book look at the facts and figures surrounding the game, it also explores the stories, heroes, characters and events that are the fabric of the game. The book details a history just as rich and just as important to the game as that of any other state or territory. Alternately, visit your local bookstore and order a copy. “More Of The Kangaroo” takes Queensland footy and it’s rich history and places it firmly on the national stage – and importantly recognises the efforts and deeds of the many, many people who have given to the game over that 150 year period – something important and extremely valuable.